Oh, Mad 'Max' ... I get it. 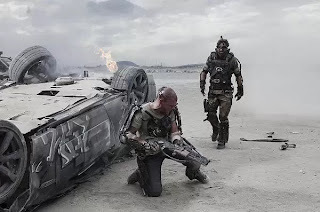 At the risk of recycling a well-worn idiom, I liked Elysium … when it was called District 9. Writer-director Neill Blomkamp follows-up his 2009 Oscar-nominated sensation with another science-fiction fable revolving around the rank mistreatment of society’s downtrodden by the privileged elite, and a genetically altered Joe who is able to breach that divide—battling a jackbooted enforcer along the way—in order to save his kinsmen. Even Sharlto Copley—who played the human-turned-prawn in District 9—is back, although this time as the murderous, paramilitary baddie. Also back is Jodie Foster, although any memory of her as a great actress is fading fast. Foster—channeling the world’s worst Vanessa Redgrave impersonation—plays Secretary Delacourt, head of defense for the titular Stanford torus space station that serves as home for the rich and privileged few in the year 2154. Those aboard the lush, climate-controlled utopia also enjoy access to private medical machines that can cure seemingly any ailment. It’s a world away from the Third World slum that Earth has become, an impoverished, overpopulated hellscape with rampant disease, pervasive crime and fleeting liberties. Refugee ships that try to escape Earth for Elysium are liable to be destroyed, and any aliens who get through are quickly deported. After Los Angeles working stiff Max de Costa (Matt Damon) absorbs a lethal dose of radiation during a workplace accident, he agrees to get outfitted with a neurologic exoskeleton by a tech-savvy freedom fighter (Wagner Moura). It turns Max into a robo-rebel who manages to download the key to Elysium’s mainframe. Immigration, access to affordable health care and the widening disparity between rich and poor are important, hot-button issues. But the way Elysium incorporates them smacks of heavy-handed hokum. Seriously, you’re telling me Elysium’s citizens won’t spare even a couple of med pods for the hoi polloi? Or that a poor populace that can otherwise develop and install a neurological suit of armor and transfer encrypted computer code from one person’s brain to another can’t figure out how to construct one cure-all gizmo? The pacing runs both frenetic and pat, the sort of phony confusion where all the plot pieces just happen to fit nicely together. Along the way, we know surprisingly little about Max—despite some nice work by Damon—and even less about Delacourt. Moreover, Blomkamp substitutes his meticulous development of time and place used in District 9 with a few opening expository title cards this time around. Elysium is agitprop masquerading as a loud, explosion-filled blockbuster—I suspect newcomer Ryan Amon composed his score while listening to Hans Zimmer’s Man of Steel soundtrack on repeat play. But even if you agree with the messaging, the way it's delivered still matters, no matter the century.